Yue Fei and the mercenary are still duking it out in the woods, while everyone just stands there to watch. Scenes like this just don’t make sense to me. If he’s distracted by an enemy who appears to be his equal, why don’t the bandits just charge up and wipe out Official Han and his underlings? Maybe I’m just not an honorable person for ignoring honor code. 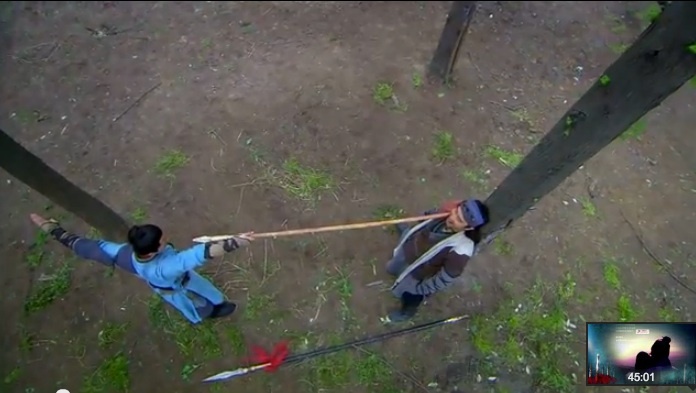 After a few rounds of pretty fighting, Yue Fei traps the mercenary (Yang Zai Xin) at a tree. The head bandit finally takes my advice and orders his subordinates to charge. Yang Zai Xin turns on the bandits and kills the leader. 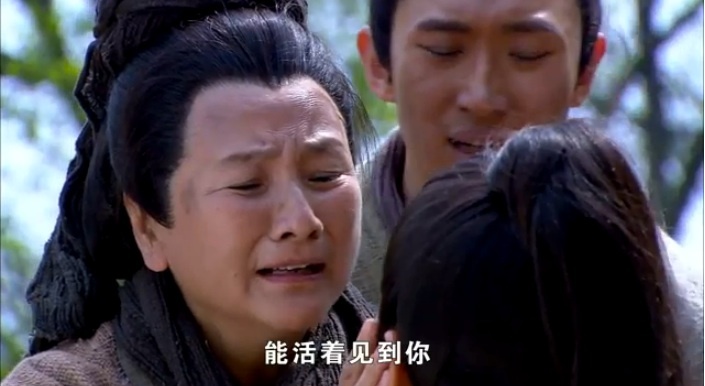 When the reinforcements finally arrive, Yue Fei pleads for Yang Zai Xin’s life, since the guy proved to be honorable. 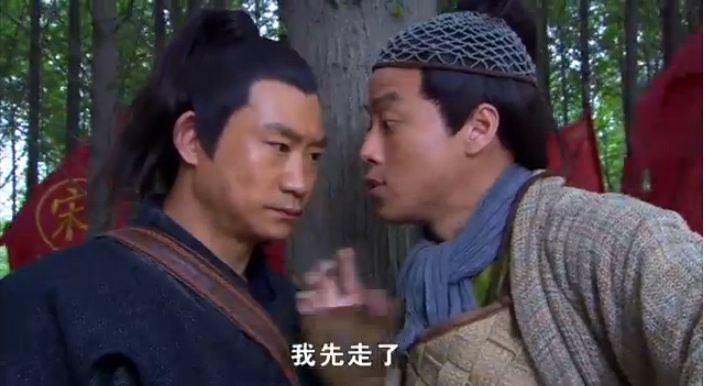 Zhang Yong, one of the bandits (and the masked guy from last night), turns out to be one of Yue Fei’s sworn brothers. Everyone gathers at Official Han’s home, in front of some river with tea floating on lily pads, in order to make poetry. LOL no wonder Jin laughs at Song. Yue Fei proves to be as intelligent as he is athletic. 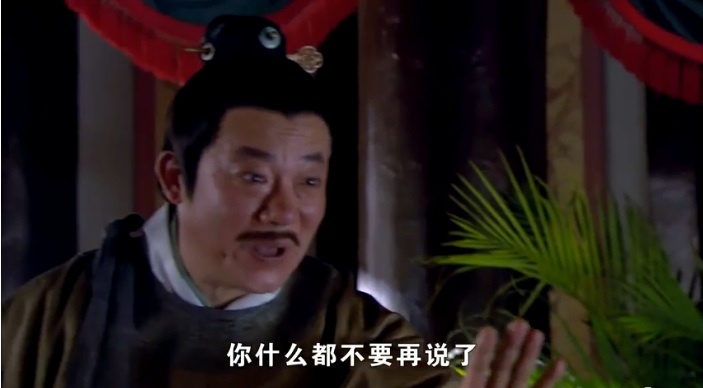 A servant comes in, saying that Yue Fei’s family is outside. Yue Fei reunites with his family, acting especially filial towards his mother, and apparently he has a daughter and a son?! Anyways, Yue Fei is the epitome of a Song man: filial, loyal, intelligent, brave, and athletic. He’s got great leadership qualities too. Yue Fei’s mom gives Yue Fei a letter from his teacher, who died after Yue Fei joined the army. OOH, Yue Fei’s teacher also taught Lin Chong from Water Margins. Anyways, the letter points out Yue Fei’s pride and stubbornness, and warns him to control his temper (a little heavy-handed foreshadowing here). Yue Fei asks for a short-term leave from the army, to help his family build up a new home. Meanwhile, Wu Zhu tries to kill more deer. Good thing the Jin girl (Ling Er) stops him. Yep, they’re lovers. They flirt among the forest leaves, while I’m distracted by Wu Zhu’s biceps. Suddenly, the 1st Jin prince jumps in, and the two sumo wrestle a bit among the leaves. Wait, what?! Ling Er is 1st Prince’s little sister? So Wu Zhu isn’t a Jin prince? 1st Prince tells the two lovebirds that he’ll only approve of their marriage if Wu Zhu helps him take over Song. Wu Zhu and Ling Er get married. We learn that Yue Fei’s wife ran away during the drought, leaving behind two kids and the elderly mother-in-law. 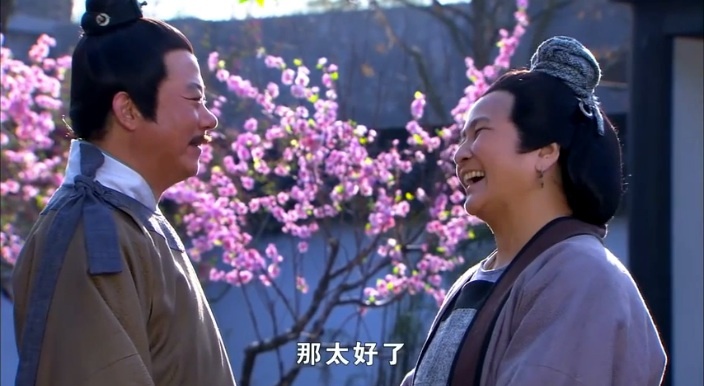 Yue Fei’s mom nags him to get a new wife to take care of him and help raise his kids. She brings up Xiao E, and plans to invite her to dinner with the family the next day. Yue Mama becomes more and more delighted with Xiao E’s household abilities. Aw, it’s so cute as the two future in laws and their families bond. Xiao E even manages bond with Yue Fei’s quiet daughter. 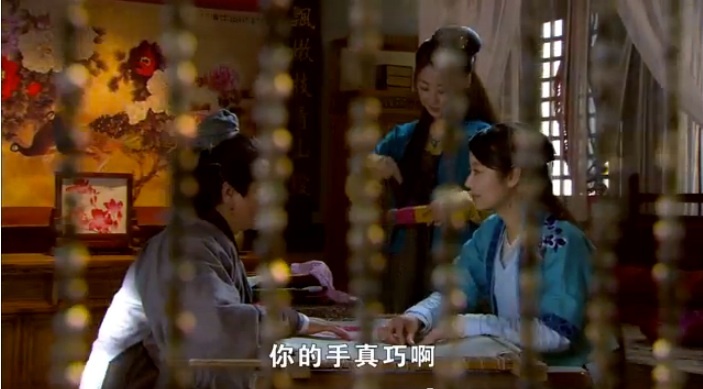 So heartwarming, so cutes…but SO AWKWARD to be Yue Fei or Xiao E at this table hahahaha. Finally, Yue Fei puts an end to the teasing by saying he’s not interested in marriage. Xiao E looks down disappointedly. But the two elders see the hearts behind the actions and plan to get their kids together. Aw, the family scenes are so so cute. 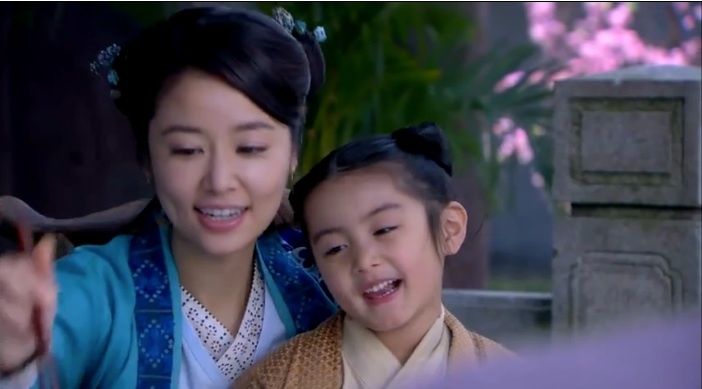 Yue Fei’s kids are so cutesy. Official Han’s conversation with Xiao E is super sweet as well. Such a touching father-daughter heart-to-heart talk. He explains Yue Fei’s fear of disappointing Xiao E, because Yue Fei knows his uncertain fate as a Song soldier during troubled times. Both kids happily (but also reluctantly) agree to get married. Hehe, even though it’s a little weird for the drama to move things along so quickly, I accept these plot movements. 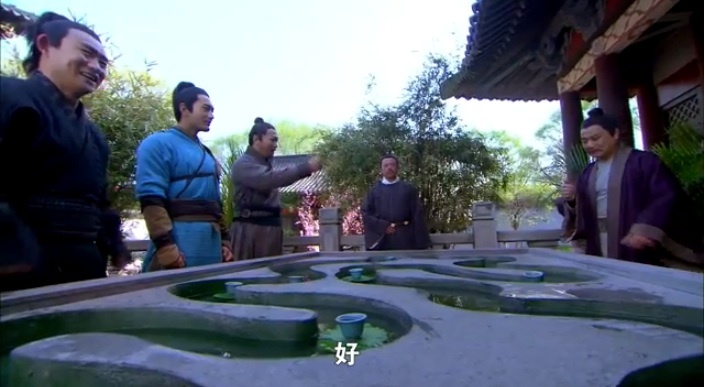 I understand Yue Fei’s set up, because all his/Xiao E’s worries were explained and laid to rest. I guess the few concerned, lingering glances from the past two episodes can persuade me that their union will be a true and happy one. It also makes sense, because this is still a very traditional match. Both parents whole-heartedly approve, both kids are filial, responsible, and loving, and most importantly, they are both willing to fulfill their societal/cultural role. Yue Fei will ride off to battle in defense of his beloved country, while Xiao E will stay at home to support him by taking care of his mother and children. On the other hand, Wu Zhu’s loveline was a bit rushed. But I can still buy it, since he and Ling Er were introduced as lovers right off the bat. I think the two weddings and the events that lead up to them are very interesting. We’ve got a nice juxtaposition of the two different cultures and two different methods of courting (referring specifically to the process leading up to the ceremony). 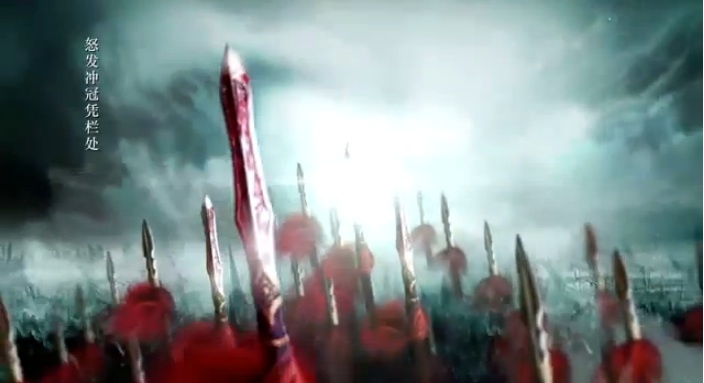 You get the sense that Yue Fei’s match is well-planned and very logical, built mostly on respect. In contrast, Wu Zhu’s union with Ling Er is very passionate and emotional, even though her brother was against them at first. This entry was posted in Chinese Dramas, Drama Recaps/Reviews, History and tagged Episode 3, Huang Xiao Ming, Jing Zhong Yue Fei, Patriot Yue Fei, Recap. Bookmark the permalink.